Housing – Iwamura Atelier Inc. 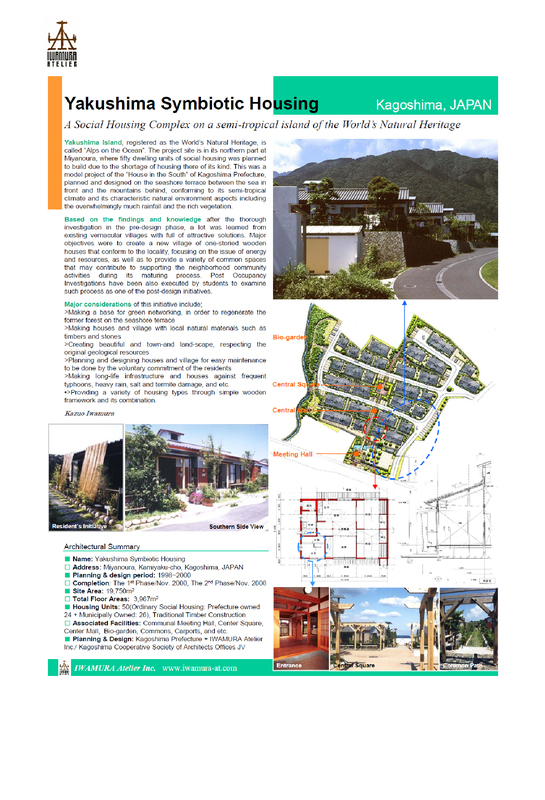 This is a urban detached house of Environmentally Symbiotic Housing, complying with state-of-the-art concept and equipped with latest resilient techniques of Housing for Human Security in preparation for natural disasters including a great earthquake predicted to happen soon or later in the metropolitan region. A detached environmentally symbiotic house located in a suburban residential area. It was specifically designed as a healthy living place for a family having suffered from allergy since quite a long time due to VOC contained in the building materials. A wooden compact house with an office located in a densely built-up urban area. According to the given condition, a variety of solutions has been incorporated to contribute to the living comfort as well as the improvement of the neighborhood townscaping. 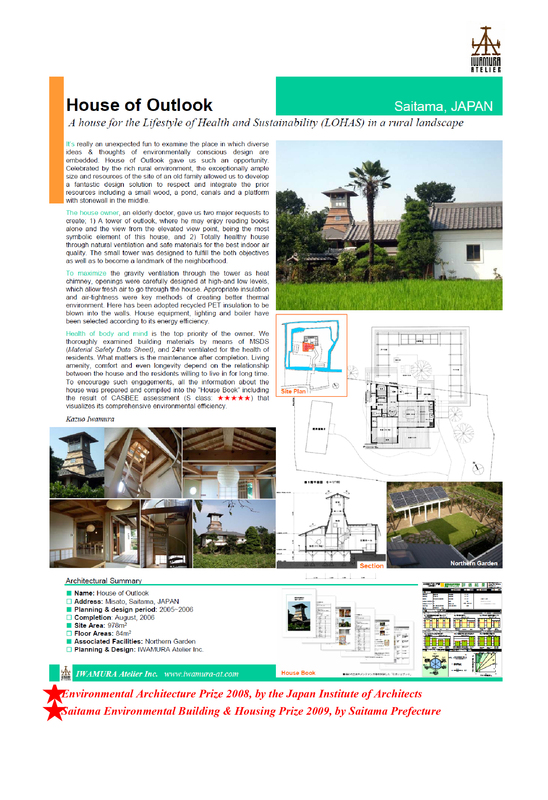 A wooden detached house, which was built and exhibited by a local builder for “TX Tsukuba Exhibition of Houses and Living.” IA designed it as an Environmentally Symbiotic Housing, which was sold after the exhibition. A weekend house on a hill, learned from the regionally specific and traditional building method. Using locally produced cedar timbers for structural and secondary elements finished with bee wax, it became a natural house. The client made efforts to work with greenery, hedges ad fences by himself, which has been wonderfully completed a year later. Located in a urban district in the metropolitan area, this wooden house was specifically designed as an environmentally symbiotic housing to be lived with elderly family member in the near future, which was rated as the Class A by CASBEE-Detached House. This detached timber wooden house in a suburban area was designed for three generations to be sustainable respecting the existed resources. By the residents’ initiatives, a part of the site was opened to neighbors as a community pocket park. 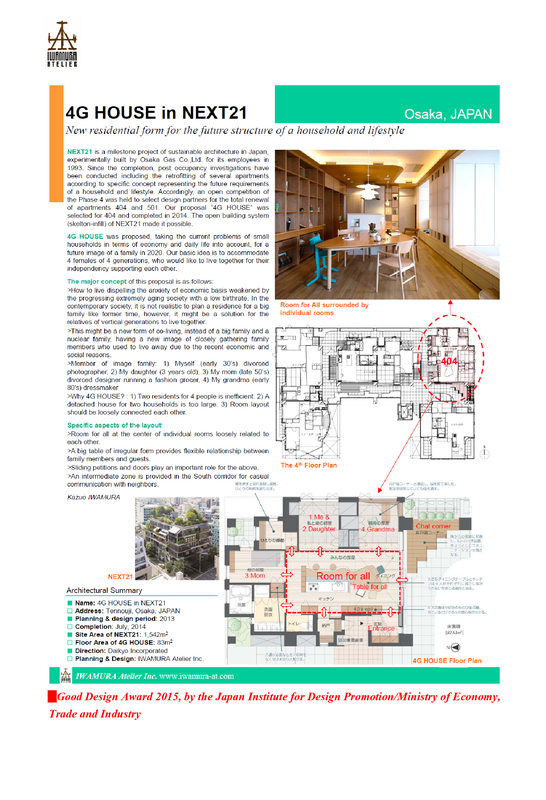 Setagaya Environmentally Symbiotic Housing : JV with Ichiura Co.Ltd. These houses were developed as region specific proto type wooden housing for Ryugasaki Newtown, according to Environmentally Symbiotic Housing concept. The traditional timber house building method has been modernized to create an affordable and sustainable house to enjoy maximum wooden atmosphere. Extension of a old farmer’s house has been completed reflecting the idea of Environmentally Symbiotic Housing. 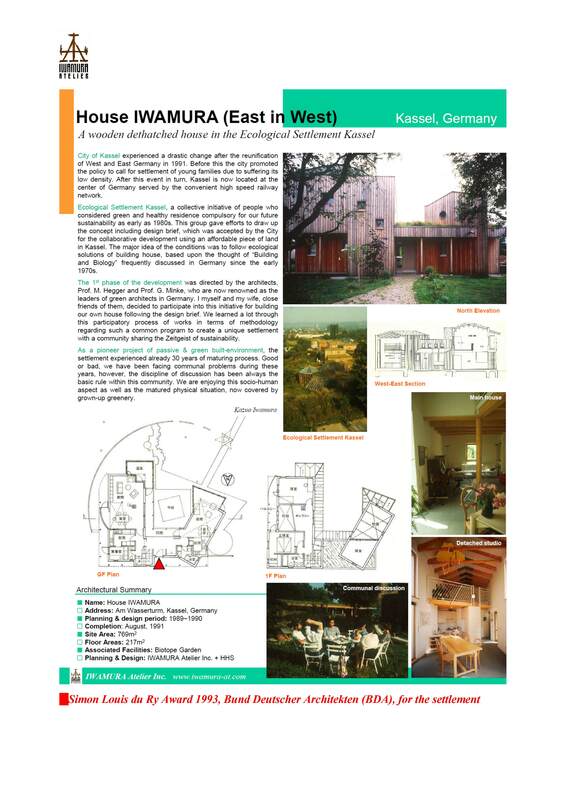 The client family of four generations, leading a very ecological lifestyle of farming, allowed to build an open and wooden house independent of mechanical indoor systems. This high-rise condominium has been designed as a town renewal project, subsidized by the national and local government. From the very beginning, IA helped organize the land owners organization as well as the brain network to implement this complex project incorporating the memories of the place. On a site of the IWAKI Fusha Village (see below), this exhibition house was built by a local contractor as a model ESH through the planning and design by IWAMURA Atelier, which attracted many visitors during the exhibition. 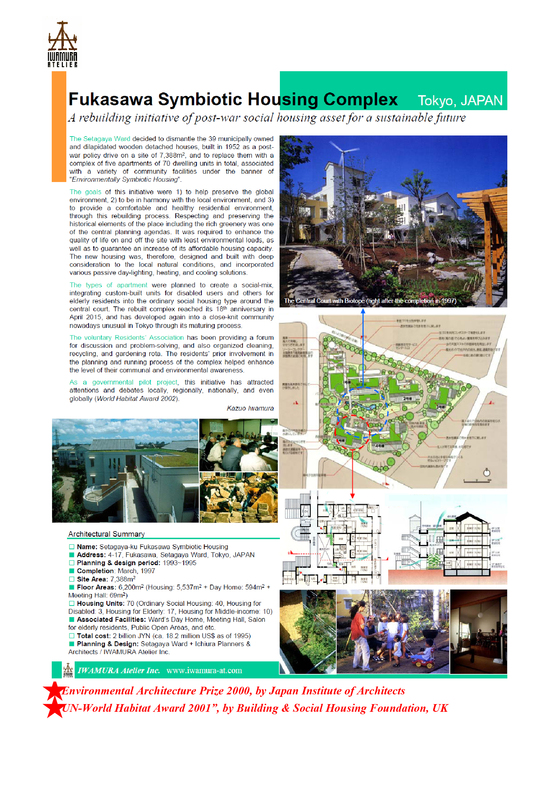 To commemorate the 20th year after establishing the Public Corporation for Regional Development, Joban Chapter, “IWAKI Fusha Village” was newly developed to publicly exhibit the concept of Environmentally Symbiotic Housing embracing a biotope pond at the center. 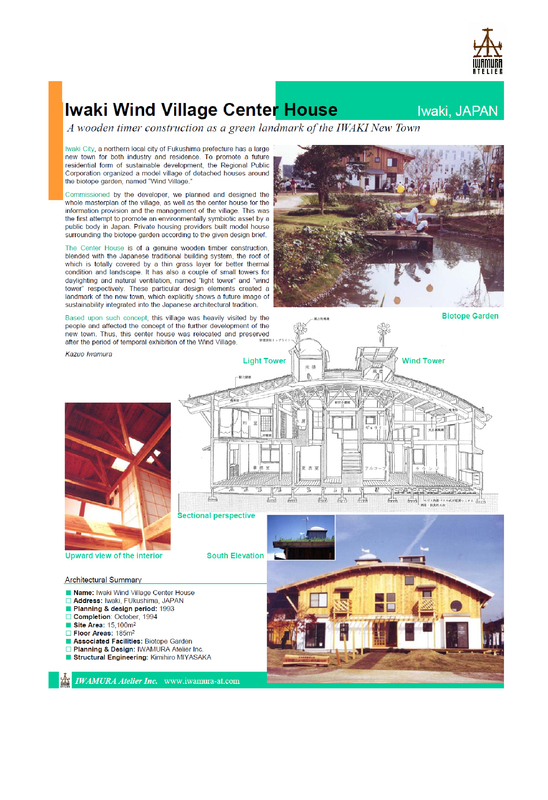 To commemorate the 30th year after establishing the City of Kitakyushu, “Global Village No.1” was newly developed to publicly exhibit the concept of Environmentally Symbiotic Housing for the 1st time, including this center house. After 3 years housing exhibition, it was moved for eternal use as an ESH museum. IWAMURA Atelier produced this low-rise urban condominium all through the project process as a rebuilding initiative of old detached houses. Taking advantage of the complicated topography, we tried to execute 6 dwelling units of comfort as well as an attractive town scape. This row house was planned and designed on a flag-shape site within the calm residential area in Nakameguro, privately developed after the War. Since its completion, IWAMURA and IA used this wooden buliding for 25 years as a residence and an office.